Here, in this raw account of one doctor’s journey to Hell and back and the creation of the “12 Prescriptions for Awareness” that could save the life of someone you love. As Head of the Department of Vascular Surgery at a large community hospital, Dr. Steve Heird was well aware that addiction can reach anyone regardless of social class, education, or occupation. 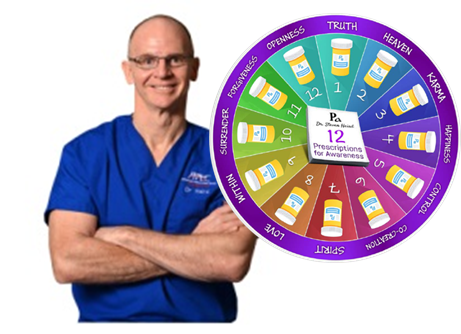 Steve’s personal journey with addiction and his path to healing has led to the creation of the “12 Prescriptions for Awareness”. 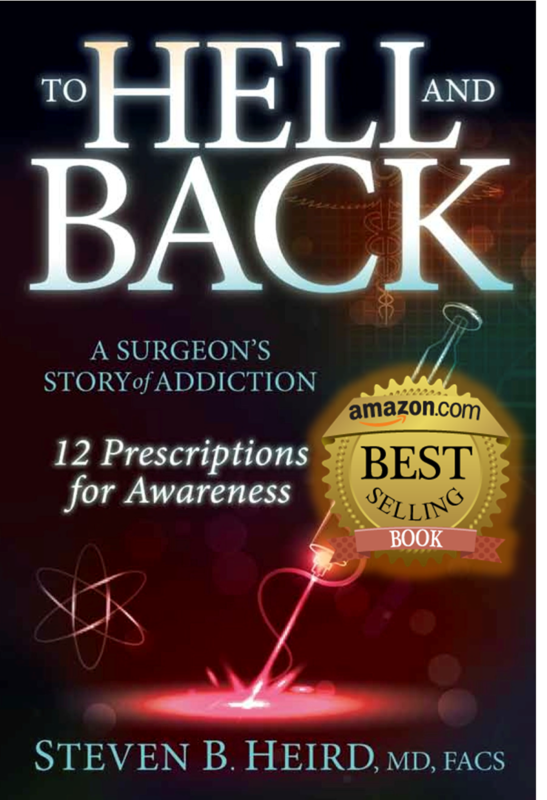 In this entertaining and inspiring true-life account, and through his Prescriptions For Awareness healing program, Dr. Heird proves beyond a doubt that NOBODY is entirely “above the reach” of addiction, and no addict need ever feel doomed to remain forever within its grasp. Regardless of the apparent helplessness of addiction there are 12 prescriptions that will aid in re-claiming your life. Prescription drugs and other so called "Healing medicines" don't work as well as you think. Contained within these pages are the 12 prescriptions that will transform your life. So many people put on a good face, but what is happening for real is a completely different story. No matter what addiction you face; illegal drugs, legal drugs, alcohol, or even food, it will always rear its ugly head; no-matter how much you try to hide it. My illegal activities started to get noticed by the authorities and they started to close in on me. Realize that the monster of addiction can get you regardless of your upbringing. How childhood directed my path, although I did not recognize it at the time. The country’s war on drugs and other illegal substances began while I was in middle school but alas the message did not get through the way they intended. I was not perceived as a great student, however, despite that perception I worked extremely hard and the pressure was mounting. Doctor? Ski-Bum? or both? The adventurous journey begins. Being an addict doesn’t suppress the good that is within you. It temporarily sequesters what you fear so you don’t have to deal with it. May 25, 1984 I began two chapters of my life; One as a vascular surgeon and one as a husband; The two worlds collided. The first time I heard the voice of God speak to me, a shift in my thinking occurred, thereby transforming my life. Endless surgeries, countless family commitments, and loads of outside pressures met that something had to give. The only place left when DEA agents show up at your door. G.O.D heals all… Good Orderly Direction! Learn to surrender to a higher power. Freedom in the presence of feeling “GOD”; an incredible blessing to awaken to as a former addict. My addiction was ending, my conscious awakening was beginning, and not everyone was onboard. This entire journey that ended my addiction, empowered my sobriety, and heightened my consciousness resulted with these 12 Prescriptions for Awareness, curing me of my pain once and for all. 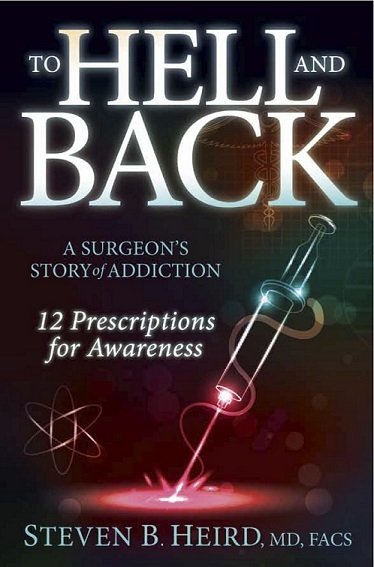 In To Hell and Back, Steve Heird is refreshingly honest about his struggles with the addiction as a well-respected physician. His humble nature, sense of humor, and raw honesty are inspiring, and his insights on healing and awareness will help many who are struggling in their darkest days to hold out for the hope and light available to us all. When you lose your way on the journey of life, his mottoes to live by will guide you through the difficult times and help you to find you way. Dr. Steve Hierd’s experience can be your life coach and the guide you require so your pain becomes the labor pain of your self-birth. In your hands is a prescription unlike any you have ever had before. Once you read this book you will have something “refillable” that never will run out for a life you absolutely love living. This book is medicine for your Soul. Steven B. Heird, MD, FACS, received his undergraduate education at Washington and Lee University. He subsequently graduated from the University of Maryland School of Medicine in 1984. After his general surgery training at York Hospital, he completed a vascular surgery fellowship at The Hospital of the University of Pennsylvania. Dr. Heird holds certifications in both general surgery and in the specialty of vascular surgery. He is a Fellow of the American College of Surgeons and has practiced vascular surgery for over 20 years with an emphasis on the diagnosis and treatment of venous diseases, as well as chronic wound care. Since Dr. Heird opened the Advanced Vein and Laser Center, Inc., he has devoted his skills and expertise to the entire spectrum of venous diseases while utilizing the most modern modalities of therapy available. Owner of three companies: AVLC, Theia Light Center, and a Bikram Yoga Studio. Devoted to eliminating Dis-Ease and bringing harmonious, healthy living to our planet. The Definitive Guide On "Releasing Any Addiction.. Large Or Small"